Saturday saw us make the short journey down to the coast to Victoria Park where 2016/17 Highland League champions Buckie Thistle provided local derby opposition. The KSC contingent was depleted, with former Buckie Rovers superfan and converted KSC secretary in Manchester on a weekend with his wife. Stooie Walker was gutted to miss the game, a perfect opportunity to get one over on his many friends from the coastal town. Confidence in the Maroon camp was high going into the game, with anticipation intensified following the welcome Macaulay Rae signing news. 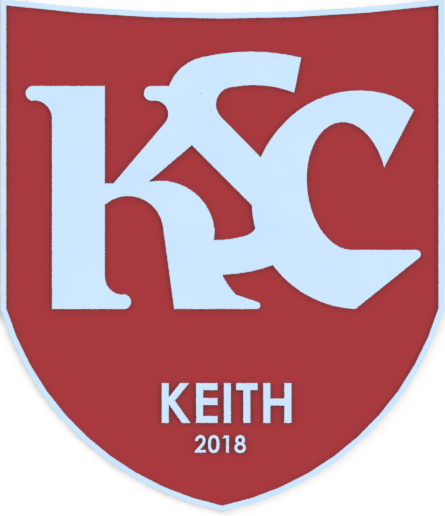 The towering centre back was officially announced a Maroon on the morning of the game, brought in by Deano to strengthen the youthful Keith defence. The KSC excitement was tempered by the news that Bradley Manson, Macaulay’s partner in defence, was ruled out injured. Nevertheless, veteran striker Jamie McAllister once again stepped into the heart of defence to provide an excellent rock in support of the former Banks O Dee man. The game kicked off and possession was shared evenly in the early exchanges, the first incident on the 20-minute mark when Keith had a strong appeal for a penalty waved away by the referee following a heavy challenge in the box. The game began to go the Maroons’ way, and in the 27th minute, Lennox played a superb ball through the Buckie defence to find Cammy in the box, and better control by our number 9 might have led to the opener. That was as much as Keith’s first half attacking threat offered, with the final 15 minutes played on the back foot. Keith ‘keeper Greg Simmo proved his worth with an excellent couple of saves, one of which from an outstanding header, followed by an even better stop. The KSC following doubled in numbers at half time as Gogs Moore joined the party following a visit to The Angry Barber. The barber wasn’t to be the only angry man in Buckie at 5pm after a superb second half display from Keith, as, like last week against Rothes they came back from falling behind. Unfortunately for Simmo, he was caught out on the ball by Buckie forward, Scott Adams, who coolly gave Buckie the lead. Despite the error, the away support were grateful to be just 1-0 down thanks to Simmo’s first half display. Keith’s management team switched things around, swapping Keir’s and Selfridge’s positions. Selfie, playing in the number 10 role, seemed to offer a different threat and the Maroons’ resilience and determination was rewarded in the 65th minute when the ball fell to Lennox inside the penalty box. With Jamie hunting down Cammy at the top of Keith’s goalscoring charts he does not miss these opportunities, and he joyfully fired the ball into the Buckie net. The game now sat on a knife edge with the Buckie support increasingly anxious about their team’s performance, but with 5 minutes left, a swinging Buckie corner was met by bandaged veteran defender MacKinnon whose header smacked against the Keith upright. This opportunity was the closest that Buckie would come in the closing minutes. With Keith beginning to control play as the clock ticked down, the previous week’s late drama against our Speyside neighbours came to mind. Just as we were discussing the possibility of sneaking another win, Selfie’s corner was powerfully met by the head of makeshift defender Jamie McAllister who sent the Keith bench wild as he grabbed the winning goal. What a time to take the lead as it proved to be the final touch of the ball! KSC member Gogs’ uncharacteristic jumps of joy more than matched those displayed during his date night at Innoflate a week or so earlier! A very happy KSC Whatsapp group celebration erupted, delirious members dreaming that this may be our year! KEITH – Simpson, Hutcheon, Smith, McAllister, Rae, Lennox, Brownie, Macaskill, Keith, Keir(Barron 74), Selfridge. Subs unused – Norris, Young, Robertson, Cowie, Stewart.